How precise are these services? I'm looking at two guns (CYMA/JG) listed as 360 and 360-400 fps. I need around 338-349, can I just whack a suppressor on the 360 and get the other downgraded to 340? Or should I just get both downgraded. A suppressor is just a hollow tube at the end of your barrel, it won't have any effect on muzzle energy at all. Best to get TWG to downgrade the springs before shipping it. Suppressors don't slow the bullet velocity of real guns down and certainly it doesn't slow a BB down. Its one of those nonsence balancing mechanics from computer games that a lot of people seem to misunderstand and think it might be a real effect. It isn't. Funnily enough that's not where I got that idea from. In the end I just got the one gun, and asked for TWG to reduce it to 335. Bought a bunch of different length suppressors, but only cus they look nice. Airsoft Engineering ones with no text. I think the point with regards to FPS drop is that it puts the gun further away from the chronograph, granting the BB more time to lose force. But that's a whole other topic about whether the muzzle is the end of the inner or outer barrel. There's no conversation to be had there, the muzzle is the end of your gun, e.g. Where the outer barrel/suppressor ends. Aye. I'd also say the FPS drop over the first metre is going to be so negligible it probably won't even show up during your crono. It does but only by about 2 to 5 fps I found which isnt going to make a difference. Checked it before by using the Xcortech x3300w and a normal chrono. Fired through as normal to check the difference between the two and then started moving back so I knew the difference was distance not different chronos. When I get a new stand alone chrono will try it at different distances and post results. In completely unrelated news, I shall now be attaching a 500cm long suppressor to my M249 for all cronos. 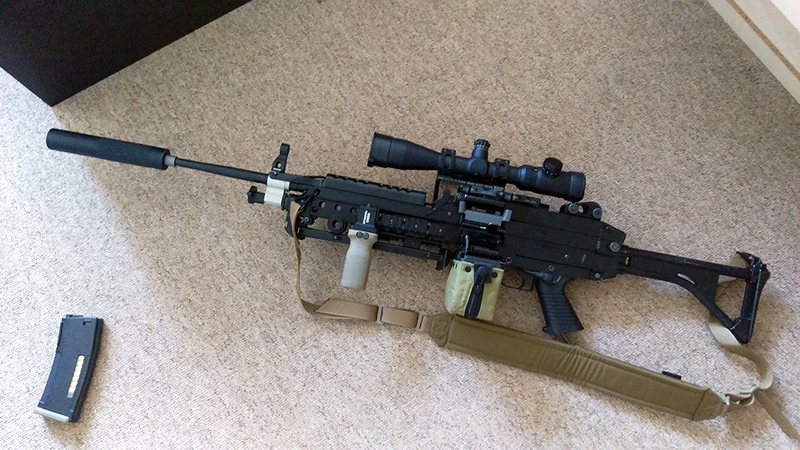 Use a proper barrel extension inside then you can have a M249 dmr. Just dont lock it to semi. Full auto sniper with a box mag. Well currently it's a 50cm barrel so it's already the longest you can get. Should I slap a scope on and call it a dee emm arr? Well, I only mentioned it off of some passing comments, I've no evidence or proof that the phenomenon of measurable fps drop between an inner barrel's terminus and the weapon's muzzle occurs or does not occur, but I trust my source. Once I get a chrono of my own i'll be testing for my own interests. But only because I just bought 30cm of outer barrel to put on my gun - because why not. Make it your own, right? At my last game day I chronoed 5/5 351 FPS. Way ahead of ya. Overall length is now 120cm. Barrel length is 69cm (ehe). How can something so wrong also be so right?